A 500lb explosive was discovered only 15 years from the home of Irish American (yes we are still claiming him) hunky actor, George Clooney. Now before you begin jumping to any conclusions the bomb wasn't planted in an attempt on Clooney's life. It's been there for a pretty long time, as long as World War 2 in fact. The explosive was found in Lake Como deep under the water and right in front of the actors uber fancy 30-bedroom mansion. As bomb experts were called in to make sure the bomb wasn't a danger and to remove it, the little town of Laglio was sealed off until the specialists disabled the device. Clooney is not at the Villa at the minute but I'm sure he would have found the whole thing very interesting. 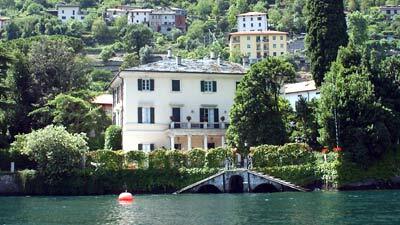 Clooney purchased the Villa in 2001 for $12 million. However, a few months ago he announced his plans to sell the villa. Rumors are that the Beckham's and a Russian vodka billionaire are in a bidding war for the famous villa. Real estate experts believe it could fetch about $50.